The service will take place on Friday 27 November at 1.45 pm in St. Andrew’s Methodist Church, Huddersfield Road, Halifax, HX3 0AT. Choir members are requested to arrive in good time wearing appropriate dress for the occasion and with a copy of Messiah. Choir members may leave their cars in the car park of the Church of Jesus Christ of Latter Day Saints, Stafford Road, Halifax. HX3 0PA. Her contribution to the life and well-being of Overgate Hospice Choir, its members, its concerts and social activities was immeasurable. She worked hard and indefatigably and had begun to relish her new role as Vice-Chairman after many years’ sterling service as Secretary. In recent weeks, in the unavoidable absence of John Hone, Choir Chairman, Valerie had graciously, and seemingly effortlessly, hosted the Choir’s acclaimed account of Messiah at Halifax Minster in October; the Wednesday previous to the concert she had presented a cheque for £7,500 as a result of the Choir’s recent music-making to Val Steele, Chair of Overgate Hospice Board of Directors. Since 1991, the Choir has raised £269,626 for Overgate Hospice and Valerie was thrilled and justifiably proud with and of this tremendous achievement. She pestered the (sometimes reluctant) staff of the “Courier” into publicising our events and supporting us generally; she has sought out sponsors and encouraged them to contribute towards our marginal costs. She wrote countless thankyou letters and for conductor, accompanist and solo artists no concert ever went by without a cheery and appreciative email from her. 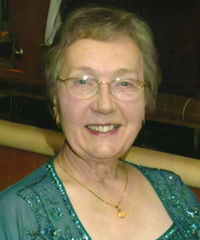 Val was active in so many ways throughout Calderdale in support of cultural endeavour – drama as well as music – and, of course, in her great and unstinting support of St Andrew’s Methodist Church, Halifax. Additionally, and significantly for many of us, she was a significant link with great Calderdale musical figures of yesteryear – with the likes of Enid Walker and Shackleton Pollard to name but two. Mrs Ashworth had grown up in the area, making friendships as a youngster that lasted for decades and often involved those who became backbones of the Overgate musical resource – with its proud claim to be the very first Choir founded solely to raise money for its local hospice and still going strong a quarter of a century after that prototype Voices for Hospices evening way back in 1991. We extend our deepest sympathy to son Philip and the rest of her family near and far, and to all her very many friends. To sing in our Carol Concert on Saturday 19 December, we should attend a minimum of 7 rehearsals from a possible 10.